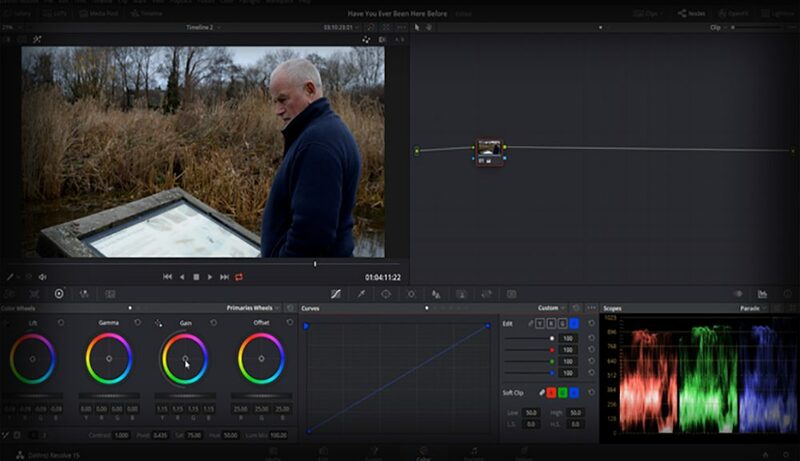 Interested in learning color grading and color correction in DaVinci Resolve? We’ll walk you through the process in this video tutorial. 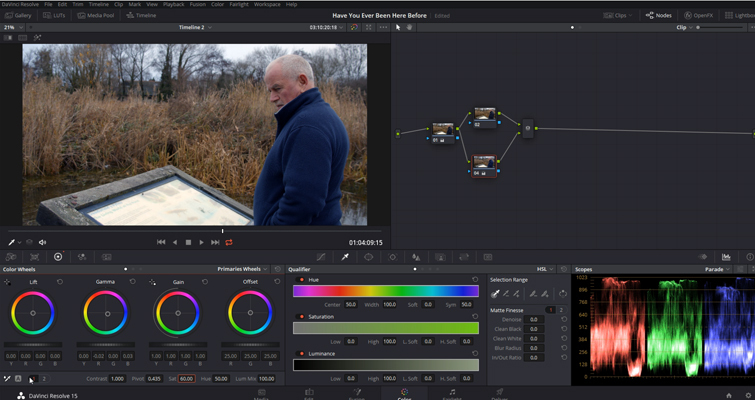 Color correcting and color grading don’t have to be daunting tasks. The process is simple enough once you’ve established a solid foundation. In this video tutorial, I’ll guide you through correcting a video clip, and then you can follow along with my grading process to get an idea of how to give your footage a creative — but basic — grade. It’s essential to follow the video tutorial, but beneath you can find a transcript to recap on any moments you need to return to. There’s no quirky angle or complex trick to this tutorial. We’re simply going to cover correcting an image and then grading it. So, first, the difference between correcting and grading. Color correction refers to the process of correcting any rogue colors or tints that may have been picked up during recording. If your camera shoots in a log or flat profile, then it may initially be void of contrast and saturation, and the correction would include re-introducing those colors. Grading, on the other hand, is the creative process that gives the image a color cast that wasn’t present in the real world; it creates an atmosphere that communicates the tone of the story or location. Or, more simply, it just gives the film a unique feel. 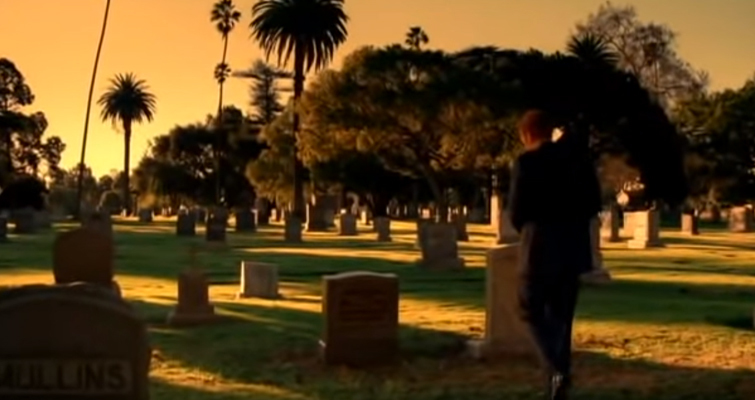 Think CSI: Miami — gradient sky. I filmed this on a cold Welsh morning in early winter. The sky is gray, the leaves have fallen from the branches, and the weeds have withered. So it’s not a very colorful image. That means we won’t be able to make this look like a beautiful summer day without destroying some element of the image data — and without the grade just looking plain silly. So, in Resolve, let’s head to the Color Page. 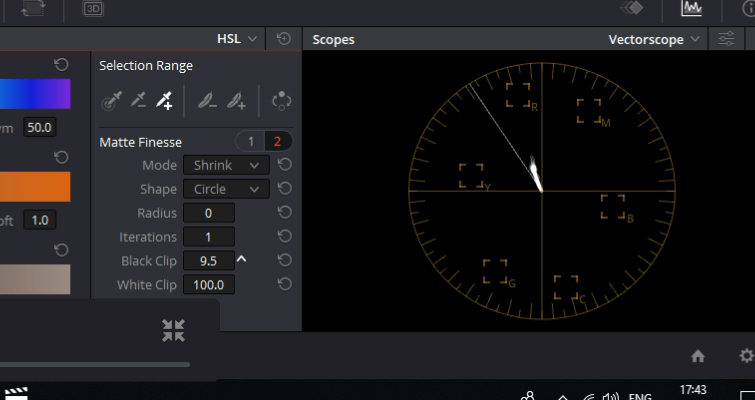 One of the very first things we need to do is make our scopes visible, especially the RGB parade, because correcting an image without these is akin to filming a scene without a monitor or recording sound without headphones. The parade displays the RGB values along a vertical graph depicting the highlights and shadows. Naturally, the top of the graph is the highlight value of the image in the viewer, the bottom is the shadows, and the middle is the midtones. So if I were to lower the shadows, the red, green, and blue values would all drop to reflect the adjustment. If I were to introduce reds into the highlights, we could see the red highlight values increase. This scope, in particular, can help identify problems in your image. I’m going to reset the node and correct the image. Due to the flat nature of the recorded format, we need to introduce contrast, and we can see that (as in our scope) the tonal range centers in the midtones. 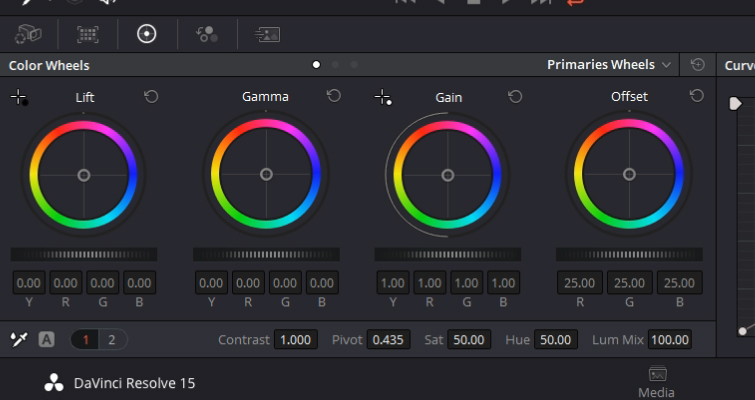 So, I’m going to lower the shadows (lift) until the lowest value just about touches the floor of the RGB parade, and I’m then going to increase the highlights (which is the gain wheel) until these top values reach the top of the parade. 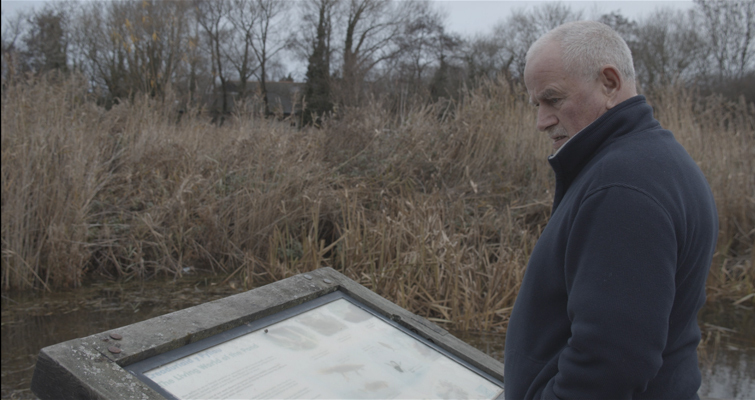 Now we have fundamental contrast in our image, and with a dab of saturation, we’re close to how the subject and location appeared on the day of filming. However, there’s a slight blue cast to the image. Now I said it was a cold day, but this blue is slightly unnatural and shouldn’t be there — again, we can see this information in the parade. The blue highlight value is somewhat higher than the red and the green, and this tells us that the image isn’t balanced correctly. (This is often due to an incorrectly set white balance, but there are a few factors that can cause it.) But not to worry: it’s a simple correction. We know that the highlights are where the blue is off balance, as the rest of the values across the parade are pretty much parallel. Therefore, we need to introduce a color that will cancel out the blue highlights, and when we look at the color wheel, we can see the opposite of blue is within the red region, so I’m going to very slightly — slightly is the operative word — push toward the red hue until we have balanced highlights. It doesn’t have to be perfect — just near enough will help balance the image. In fact, I can see that the highlights now have a little more room, so I’m going to increase those again. I would argue that this is pretty much how the location and subject looked during filming. If this was for a generic YouTube clip that we wanted to go live right away, then send it to the delivery page. But, if it’s not for a vlog or B-roll, and it needs some creative application, then we need to grade the image. 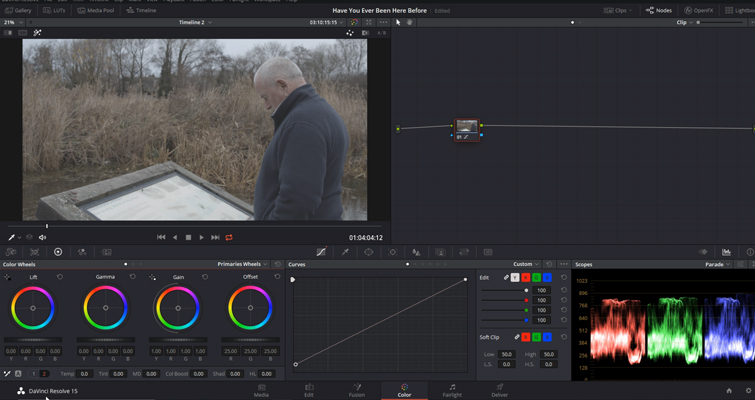 Color grading is interesting to teach because, to some extent, it’s almost impossible to explain because every image is different. You could follow my steps to a T, and your grade is going to look completely different than mine . If I were to shoot this exact scene just two hours later and apply the same grade, it would look different, and, of course, so much comes down to the color in the location and the wardrobe. 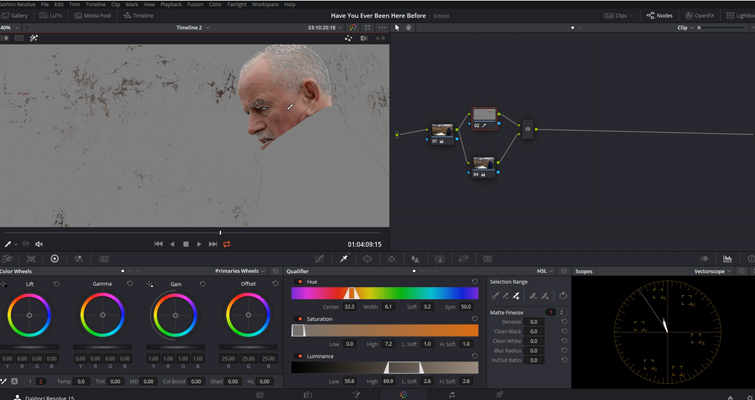 With color grading, the concept is based on theory. While I can’t fully explain the theory in just a few minutes, I can show you some of the practical grading elements so that when you do understand the theoretical aspect, you’ll know the basics of implementing your knowledge. So, let’s create a new node (Ctrl+S), and we’ll look at some of the basic tools. We’ve already analyzed to the color wheels, and these wheels are where you can apply a hue to a specific tonal region of the image, such as green into the shadows or red into the highlights. 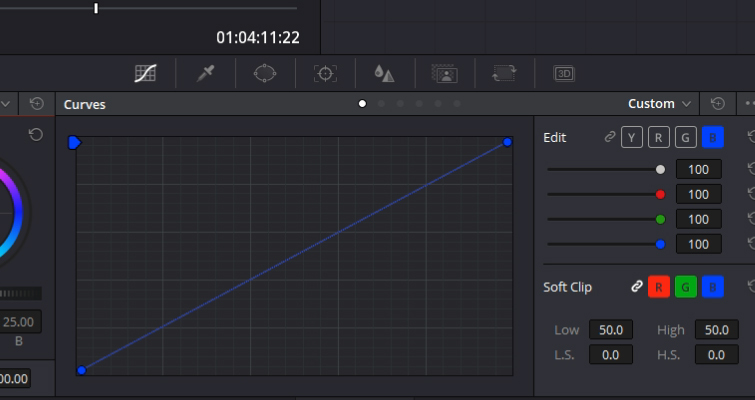 Underneath the controls, we also have a selection of tools that you may be familiar with if you’ve worked with any editing software before, such as adding saturation — or if I go to the second submenu, you can see that we can change the temperature and tint. To the right, we have many different tools, and using tool parameters, we can often change the type of tool we’re working with — such as changing the blur to a sharpen and so on. Today we’re just going to focus on using the qualifier, power windows, and tracking. The qualification tool lets you select an individual hue for specific adjustment. For example, perhaps we want to lower the saturation of this man’s jumper. Well, if we just lower the saturation here, it’s going to affect the entire image. So we can select the qualifier and click the sweater to qualify the hue. If you don’t see the hue you qualified, click the magic wand. And as you can see, we now have just the sweater in the viewer — or more specifically, we have that hue, which also encompasses other parts of the image. But we’ll talk about that aspect when I start grading. Now the creative aspect. This scene is for a theoretical crime drama. 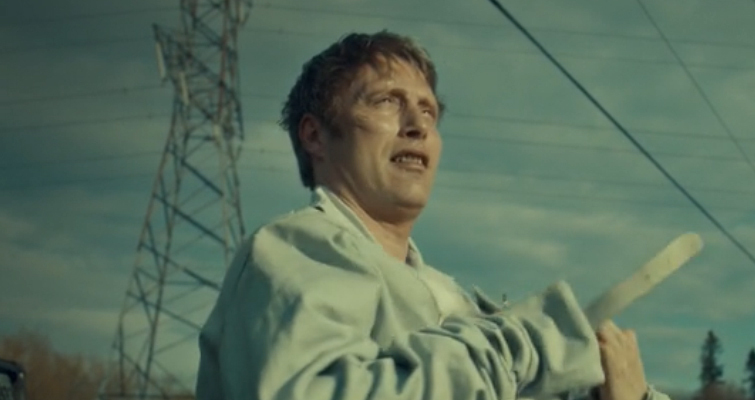 Overall, we want this scene to be cold but for the skin tones to remain neutral, and we’re going to add a little creative flavor to the sky, in the vein of Hannibal. First, I’m going to create a parallel node instead of a serial node. A parallel node essentially lets you apply overlapping adjustments at a single stage of the node tree. I’m using one to cool the entire composition and one to maintain skin tones. Now, you could do this with a serial node; however, I find it easier to keep skin qualification when working with a neutral image, and this is a simple enough grade to do this. So, let’s give this a chilling look. 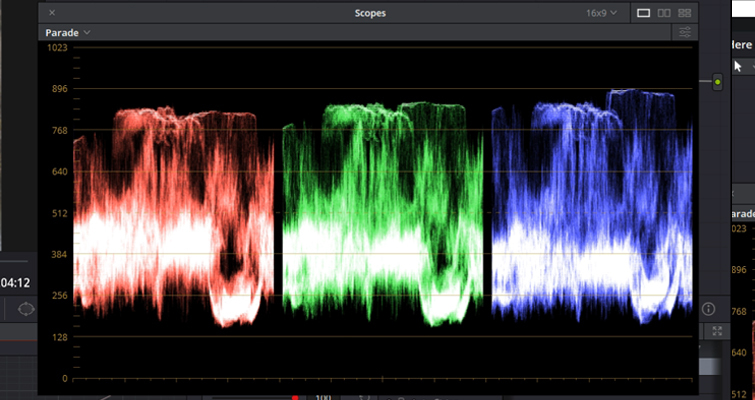 When you want to adjust the overall tone of a correctly exposed image, you ideally want to move the colors within the midtone region because, as we can see in the parade, that’s where the majority of the color information is. Therefore, I’m going to adjust the midtones color wheel — which is gamma and introduces a touch of blue — just a touch. And I’m also going to darken this cast by decreasing the midtones — again, just the slightest amount. This already looks a lot grimmer than the initial image — a lot colder. We could in theory also change the temp, but that will alter the white balance of the entire image, which is a bit different than just adding blue to the midtones. 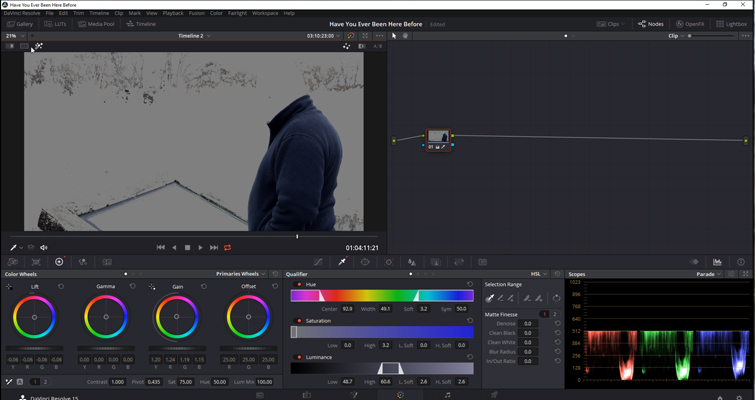 Next, we’re going to move to the node above, and we want to maintain the skin tones — which is one of the most important factors of color grading — against our cold grade. If we open the vectorscope and activate the skin tone indicator, it’ll give us an indication where the skin tones should be. The parallel node will blend these two nodes, so we have to account for the additional blue hue. So we can be a bit more generous than usual when adding the red hue to the face. However, we have a problem. The qualifier hasn’t isolated the skin tone correctly. So I can use the add color range button in the selection range tool to further isolate the skin tone. I can then make additional adjustments using the finesse settings underneath. But again, we have a problem: we have now also picked up the foliage from the scene because it shares a similar hue value with the subject’s skin tone. As a result, we need to do two things: first, create a power window around our subject’s face, which will mask 99 percent of the foliage. To do this, I’m going to open the power window tools and chose a window that is appropriate for this shot, and then we need to track the window to the movement of the subject. 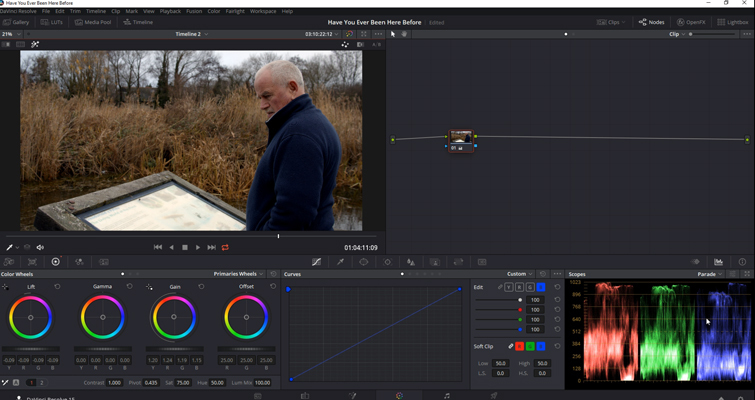 I’m going to click the tracker, and just hit analyze, and Resolve will do a fantastic job at making sure that power window stays close to the subject. With that out of the way, let’s create a new node for our sky adjustment and take a look at what we have so far. Ok, there’s a slight variation from what we started with — nothing drastic, but the tone has certainly been changed. Next, we’re going to add a little flavor into the sky, and to do this, we’re going to use the qualifier once again and click anywhere in the sky region, and we’ve got a great qualification. The sky, regarding the RGB parade, obviously correlates to the highlights; therefore, we will need to make an adjustment to the lift wheel. For the creative aspect, I’m going to push the lift into the yellows to mirror the style of Hannibal. However, I can see that the highlights have also caught an element of the historical display here. Usually, I wouldn’t mind the highlights transforming elsewhere because, in reality, if the sky is red, then the highlights elsewhere are also going to appear red. But here, I think they might be too intrusive, so I’m going to create a square power window and remove the intrusive highlights. Since the camera is locked down, I’m not going to need the tracker window for this node. 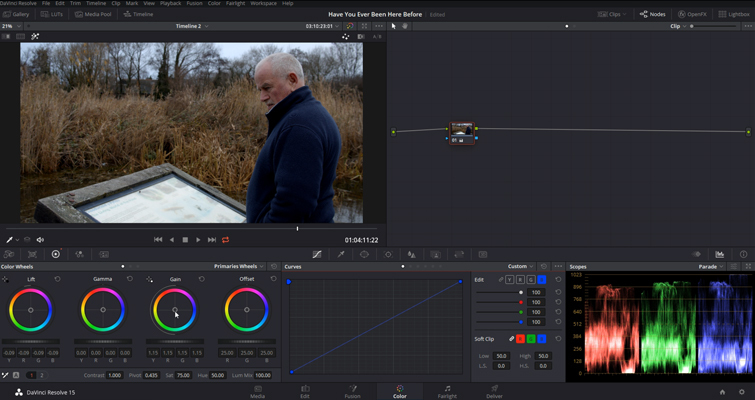 To finalize this grade, I’m going to add another node, and here I’m going to decrease the overall brightness, lower the saturation by five points, and add some film grain to make the shot slightly grittier. Some may question the need to correct an image when just a few moments later we gave the sky a yellow tint and made the image colder. You need to think about correcting the image like laying the foundations of the house. Once those foundations are established, you can then expand into more construction. 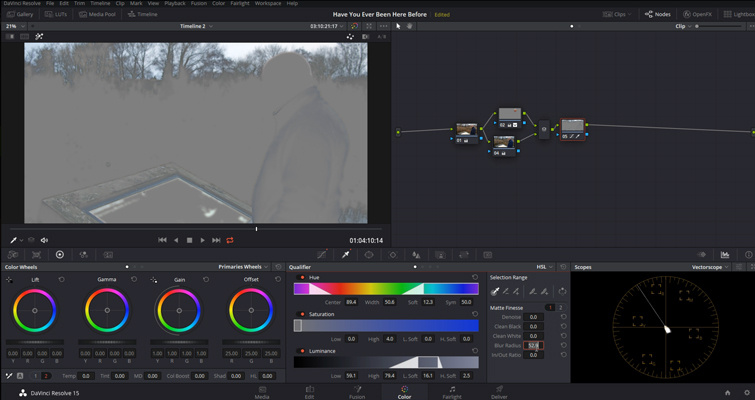 The same goes for color grading. If you were to grade an image without first correcting it, you’d find getting correct skin tones a troublesome process. Looking for more post-production tips and tricks.